With Independence Day right around the corner, it's time to start thinking about what you're going to grill up before watching the fireworks. May we suggest barbecue chicken? One sandwich is 455 calories and is topped with coleslaw, giving it a delicious crunch. This recipe provides 5 grams of fiber and 29 grams of protein; low-fat sour cream helps cut back on calories. If you want to make it even healthier, use whole-grain rolls for more fiber. 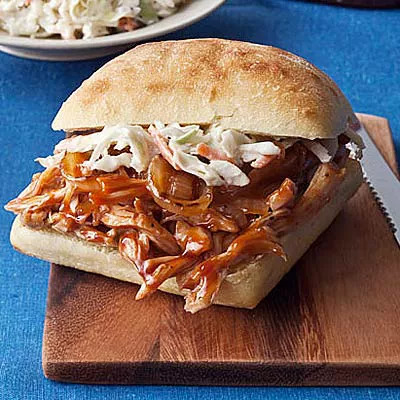 Ingredients: Onion, garlic, olive oil, skinless/boneless chicken thighs, barbecue sauce, light sour cream, cider vinegar, agave syrup, cabbage-and-carrot coleslaw mix, pepper, ciabatta rolls. 5 Homemade Veggie Burger Recipes We Love!